Squash. I feel like it’s one of those controversial vegetables like brussels sprouts and broccoli. You either love it or hate it. I don’t understand squash haters and personally, I think they are making a bit mistake. Squash is so versatile. Did you know there are over 50 varieties of squash? You can also cook it just about any way– boiled squash, fried squash, baked squash, sautéed squash, squash casserole, squash pie, squash bread. I feel like Bubba from Forrest Gump. I could really go on and on about squash. The BEST way to eat squash in my opinion is when it resembles a noodle. Conveniently, the squash king named this variety “Spaghetti Squash”. It’s genius really. A vegetable that can replace pasta! Sure, on it’s own its a little bland and boring but trust me, with the right sauce you will love it. It might even turn squash skeptics into loyal fans. This was the first time I tried a meaty sauce with my squash noodles. Result? Perfect. Tons of protein, low carb, packed with vegetables and nutrients. It’s also pretty easy on the wallet. You really can’t go wrong. If you are red meat averse, feel free to substitute ground turkey for the beef and omit the pancetta. Preheat oven to 400. Poke 4 or 5 holes in spaghetti squash and microwave for 10 minutes in a large microwave safe dish. Meanwhile, in a dutch oven or stock pot sauté the carrot, onion, celery, garlic and mushrooms over medium-high heat with 1 tbs olive oil. After the veggies are cooked through, add pancetta and cook until crispy, about 4 minutes. Next, add in ground beef and brown. Once beef is brown, drain off excess grease then add mixture back to pan. Season with salt and pepper. Add 1/4 C wine and scrape up brown bits, cook 2 minutes. Add in tomatoes, half and half, red pepper flakes and basil. SImmer on low for 35 minutes. At this point, remove the spaghetti squash. Careful, it’s hot! Cut in half and remove seeds…try and keep in as much pulp as possible. Put both sides cut-side down on a greased cooking sheet and bake 25 minutes. Remove squash, then using two forks, pull out the pulp and separate noodles into a bowl. 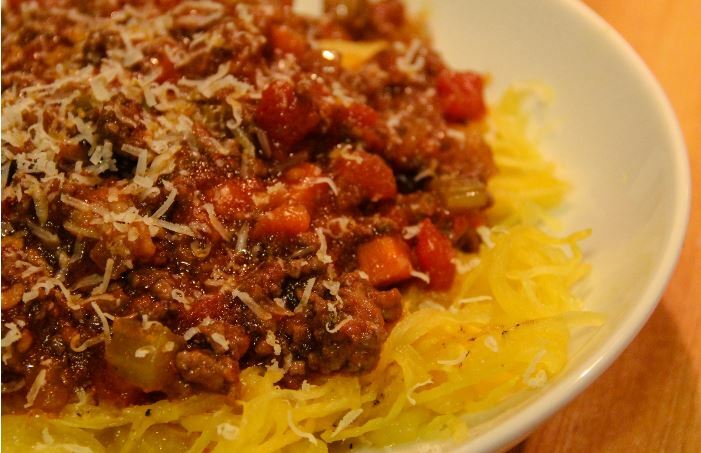 To serve, add squash noodles to bowl with a hearty scoop of Bolognese. Feel free to add grated parmesan as well! I just tried cooking spaghetti squash for the first time last week! It was great and yours sounds even better!